There's a chance that if you're checking into a luxury resort or even a fancy hotel, you'll be met by a hotel butler who will assist you with carrying bags, making reservations, and getting checked into your room. You may find yourselves quickly getting used to such pampering, but you might not immediately understand that you are meant to tip these workers for their services. Today some high-end resorts assign a butler to guests who may never before encountered one and wonder how to tip. Like Mr. Carson from "Downtown Abbey," these butlers are on a payroll but it is supplemented by tips from the guests they serve. Sometimes one suite or couple will have a dedicated butler who works for them exclusively; however, it's more common for a hotel butler to serve a number of units. As a result, butlers depend on your tips to make a living wage while working in the hotel guest services industry, so it's important for you to understand when and how to tip if you've received help. A hotel butler performs services that allow guests to spend more time enjoying their vacations, and you can often think of a butler as a personal assistant. As a result, butler services at a hotel or resort can include carrying bags, unpacking and re-packing luggage, orienting guest to the facility, making reservations, delivering room-service food, accepting garments for laundry and ironing, coordinating spa services and excursions, drawing your bath, and setting out a turndown amenity. In addition, some hotels and resorts have task-specific butlers such as technology butlers and pool butlers who bring drinks, towels, and can be pressed into service to apply sun protection. However, a hotel butler is not a chef, confessor, bartender, prostitute, stevedore, private secretary, nanny, dog walker, or a chambermaid. And even though he or she may tidy your room, they are not responsible for cleaning it fully. How much to tip your butler can depend on the number and quality of services provided, plus whether the butler worked for you exclusively or served multiple guests with the same service. It is considered standard for a butler who provides good service, to tip five percent of the room rate. For example, if you stay at a place that costs $250 per night for four nights, the total room rate would be $1,000, and the butler's share would be $50. That said, how much you tip your butler is ultimately up to your discretion. While a butler may appreciate a one-time tip of five dollars for delivering a meal, he or she will appreciate a larger tip at the end of your stay even more. 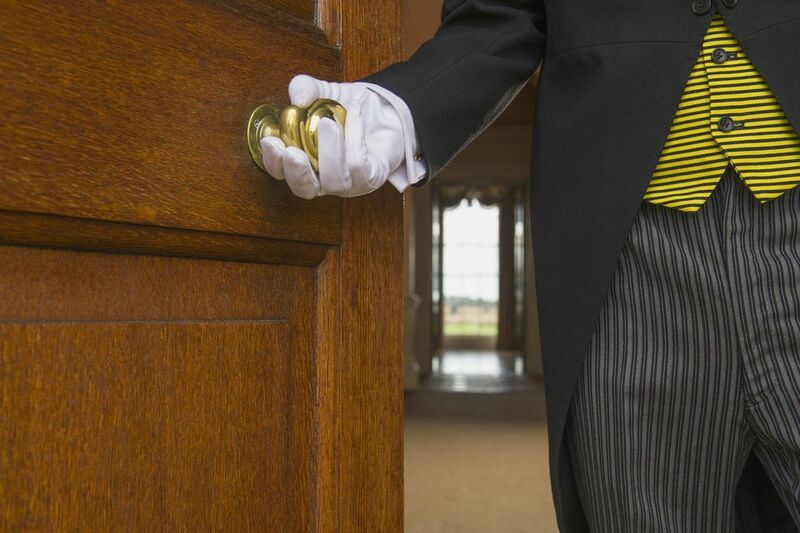 Although a butler will accept a tip at any time during your stay, including after each service is rendered, it is customary to tip your butler at the beginning when he or she delivers your bags to your room or upon checking out of the hotel. It's fine to hand a cash tip directly to your butler, but it's even nicer if you put it in an envelope with a note of thanks. If he or she is not available when you check out, leave a sealed envelope with the butler's name on it with the concierge (who also deserves a tip if she or he provides service that goes above and beyond) or staff at the front desk.